Store your farmer’s market goods openly on your counter, island or gathering table. Fill a piece of glassware with contrasting fruit. Farmhouse used to mean gingham and geese. Thanks to Joanna Gaines, it’s more refined now. Focus on the kitchen or carry the style throughout your house. Start small by painting a table. Or go big by installing shiplap and exposed beams. Shiplap panels may sound more like a nautical décor feature, but it’s a staple of farmhouse style. Historic, homes used these hardwood, cedar or pine planks in place of drywall. Installing shiplap can be a DIY project if you’re comfortable creating grooved, weather-tight overlaps. Poor installation might allow the planks to warp or rot. If you have an older home or out-of-plumb, walls you’ll probably want to hire a shiplap installer. The last thing you want is a funhouse wall with slanting shiplap. Shiplap costs about $1700 for 200 square feet. Paint the shiplap a soft white to make it the perfect backdrop. Or, you can opt for a modern look and paint it a gray or navy to create an accent wall. Just be sure to dust. 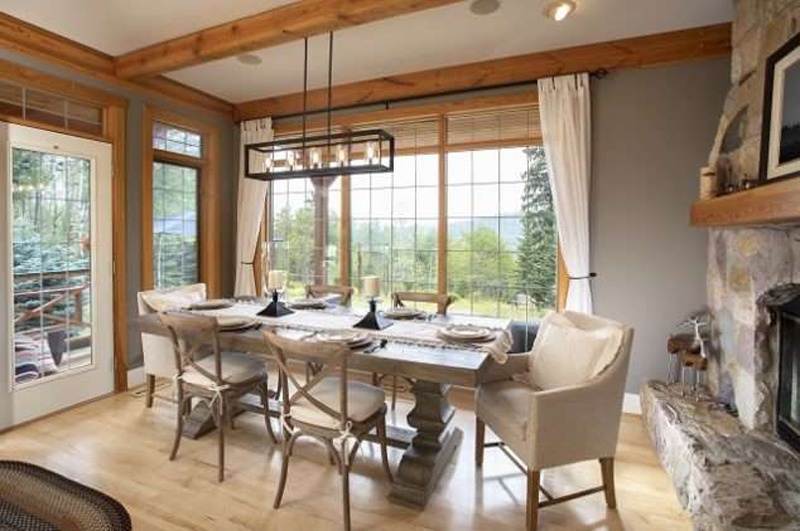 A trestle table provides a place for hanging out as well as dining. Trestles date back to the Middle Ages, are solid wood and have bench seating. (Yes, it’s an indoor picnic table.) You’ll pay anywhere from a few hundred dollars for a basic table to several thousand for an antique. A pedestal table (like above) is another good option for a farmhouse kitchen. The base is a double pedestal instead of an X, but the prices are pretty much the same. Looking for a cheaper option? Repurpose an outdoor picnic table with a new stain and bring it inside. If you’re handy with tools, you can build your own table from reclaimed wood. Or, support local artisans and have one custom made by a carpenter. 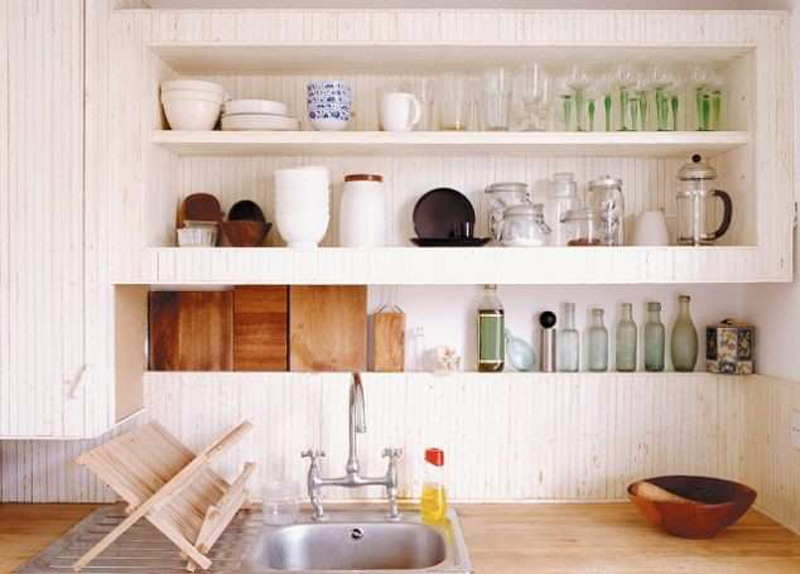 You can get open shelves in your kitchen by removing the doors on your cabinets. Display pottery, vintage kitchen tools, or just your usual china and glassware. Hang little curtains on bottom shelves to hide away Tupperware. Paint the insides a soft neutral that goes with your walls, or line the back with floral or striped wallpaper. This is a basic project you can do in a few hours. You need putty, a putty knife, caulk, and paint. That will cost about $50 for two or three cabinets. If you don’t have upper cabinets, install reclaimed wood shelves on dark metal brackets for a similar look. 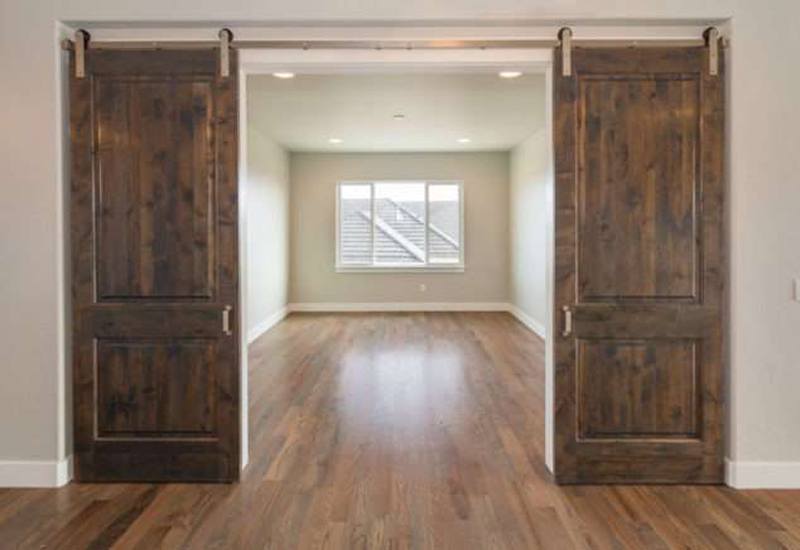 These sliding doors are an updated take on pocket doors and are perfect for farmhouse style. 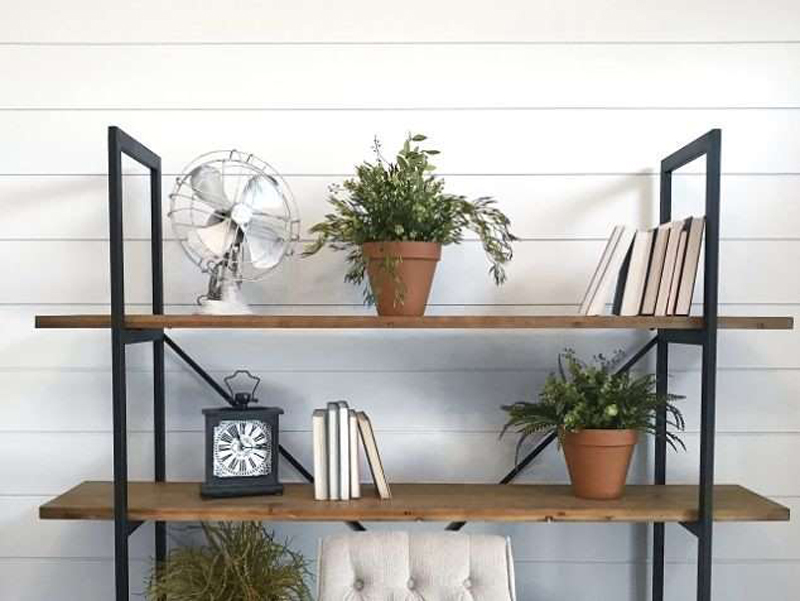 They come in a wide range of materials and styles that make great use of your space—not to mention the compliments you’ll get. Simple, Shaker-style barn doors cost around $700. A rustic, mahogany door with Z-panels and decorative hardware can cost $3,500 to install! But before you opt for hinges you should know that barn doors are highly sought after by homebuyers for their space-saving, elegant slide. Old farmhouses have seven-foot ceilings and exposed beams. 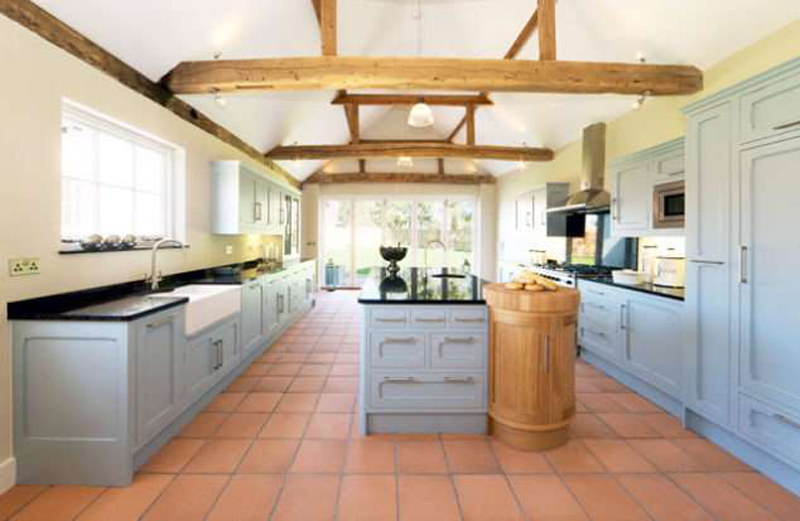 Thankfully, ceilings are taller now, but exposed beams are a great addition for a farmhouse look in your kitchen. They cost about $19 per linear foot to install. Real wood ceiling beams are heavy and dangerous to lift and install. Unless you are Paul Bunyan, hire a contractor to install your beams, or choose a faux wood instead. Polyurethane or fiberglass beams look like wood but are lighter and less expensive. Looking for more? A coffered grid might be your style. Coffered ceilings cost $25 per square foot. It takes a master carpenter to install, but it may be worth the investment for resale. A realtor will tell you that anything that sets your home apart is a strong selling feature, and coffers and beams are unusual. Accent any room with old blue and white china. You can get pieces like Blue Willow for a few dollars. Or collect milk glass; it’s opaque and made to look like fine porcelain. Display it on open shelves, or hang platters on a wall. Milk glass is inexpensive — a dollar can get you a small vase on Etsy. Give canning jars a new life as containers for herb gardens, cookie jars, button collections, or makeup brush holders. 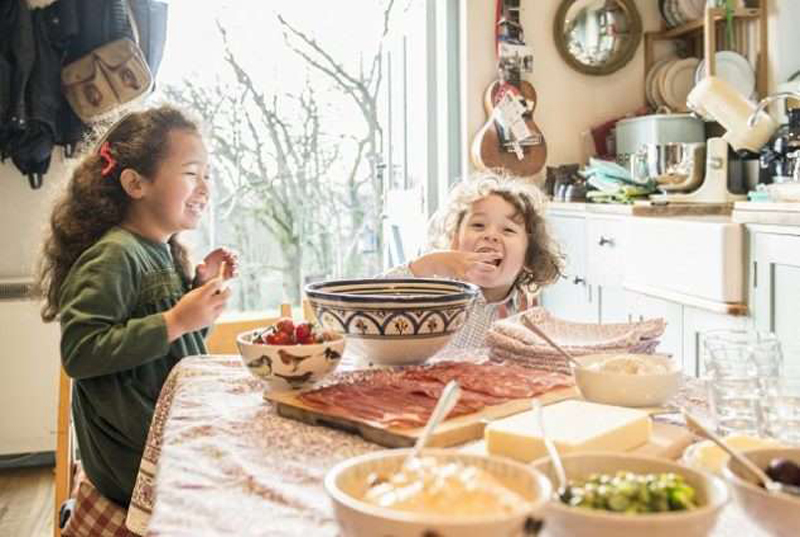 Store your farmer’s market goods openly on your counter, island or gathering table. 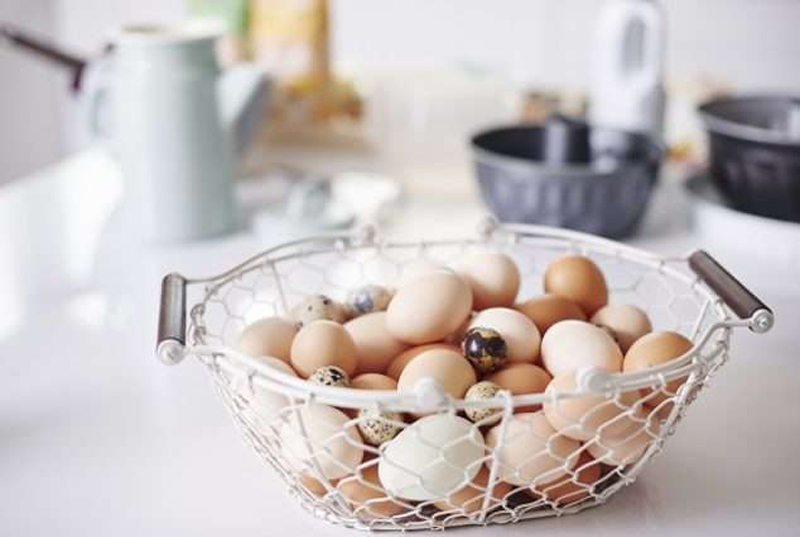 Farm-to-table eggs don’t need to be refrigerated and look great in a wire basket. Fill a piece of glassware with contrasting fruit. Leave a fresh loaf of bread on a wooden cutting board. Harvest from your own garden and proudly put the product of your green thumb on display. 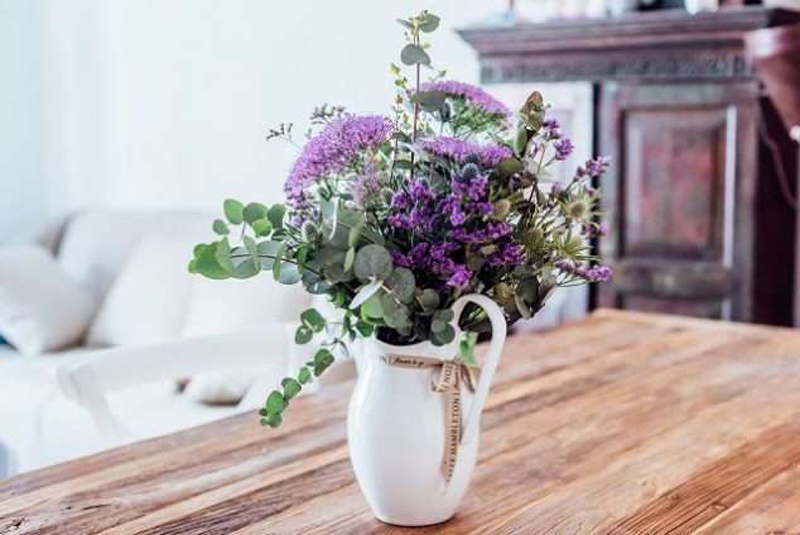 Hang flowers or herbs on an indoor clothesline or press them into matted frames to enjoy them longer and bring the nature and bounty of a farm into your home. Get creative by flipping over an old table leg and using it as a newel (the large pole at end of a stairway banister). You can find salvaged spindles online to replace old balusters. Swapping out builder-grade features like this with aged wood will give your home a true farmhouse feel—that you’ll actually touch. Sand, cut and repurpose replaced balusters as candlesticks or kiddy craft table legs. Go to your local flea market, antique store, or rural garage sale to find repurpose-able wooden treasures like distressed bureaus, cutting boards, architectural elements, wall décor or coat racks. Farmhouse lighting doesn’t mean gas lamps. Hang lanterns or a chandelier made from wood or metal. Consider options with vintage exposed Edison bulbs in your dining room. A small lantern will be about $200, and prices go up to several thousand for a designer piece. New wiring installation costs around $200, separate from the cost of the fixture. For more natural light, consider installing a new window or french doors. French doors cost about $2,500, but they also attract stylish buyers with their timeless design. 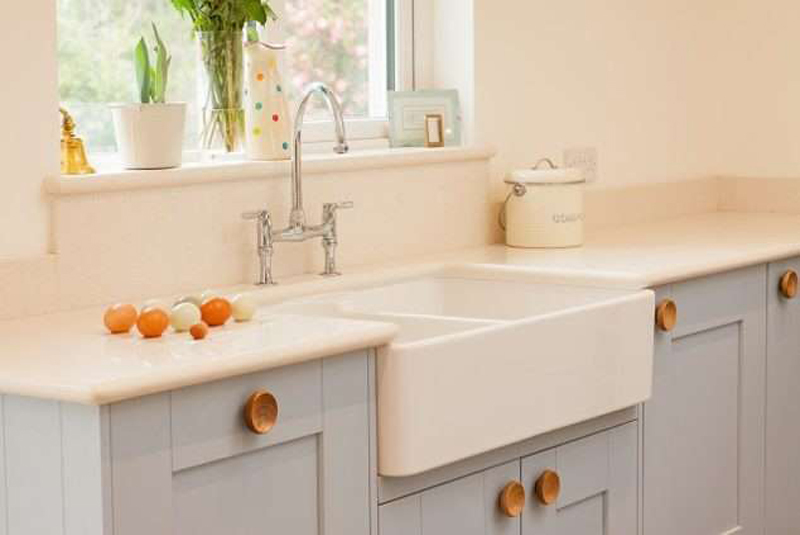 Farmhouse sinks are large sinks with an apron. 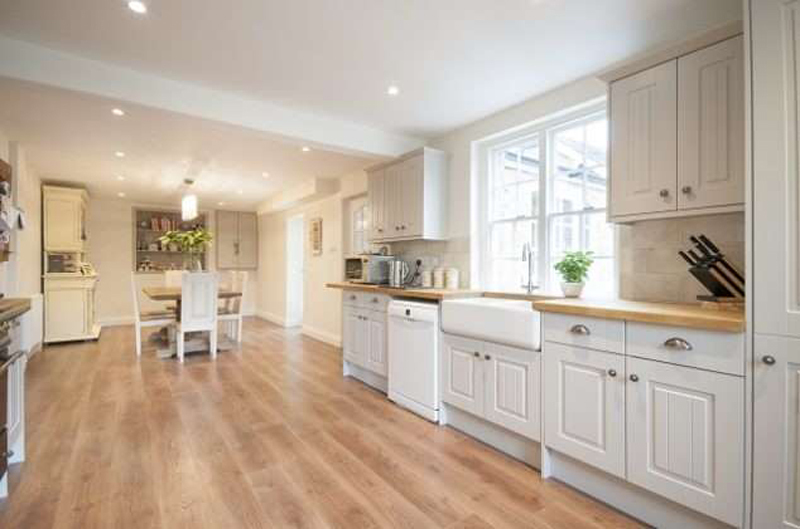 They are especially charming in a farmhouse kitchen. A plain white sink will set you back about $675, including installation. A high-end hammered copper sink is a lot more, over $1000. A copper sink is well worth the expense (and the under cabinet reinforcement to support it), and they’re antimicrobial. Refinish your dark hardwoods in a light, glossy oak or pine stain. The light colors reflect more natural light and add warmth to your rooms. Refinishing hardwoods can be expensive. Before you commit to refinishing, is recoating an option? If your floors are already an oak or pine stain, a new coat of polyurethane might be all you need. If you’ve got dark walnut and want to lighten things up, refinishing is the way to go. The cost to refinish an average 15-foot by 15-foot room (that’s 225 square feet) is anywhere between $340 to $900. This averages out to $1.50 to $4.00per square foot. You’ll pay more or less because of floor condition, how many coats of polyurethane you need and whether you have stairs. If your front door is a slightly different color around the base and knob, it’s time for some TLC. Clean it up and if it still doesn’t have that farmhouse look, find a dusty hue and paint your door—and maybe even replace the knob, bolt and knocker. This simple facelift isn’t complete without the perfect wreath. Find a simple wreath that suits your style and complements the new color. For instance, if you opted for a soft blue, look for bursts of golden forsythia or sunflowers. Swap those for cotton or eucalyptus for a less saturated, picture-perfect exterior. Did we say cotton and eucalyptus? These are staples of farmhouse style. Faux stems and wreaths abound at your favorite retail spots. But they aren’t the easiest to grow if you’re looking for garden-to-vase affordability. Tulips, sunflowers, berries, and hydrangeas are great ways to add pops of color and life to a white canvas. Wild flowers, baptisia and snapdragons have a natural ombré and make beautiful porch neighbors and coffee table bouquets. Complete the perfect floral design by putting your bundle in a decorative pitcher or trimming your new wreath with burlap, plaid, or twine. 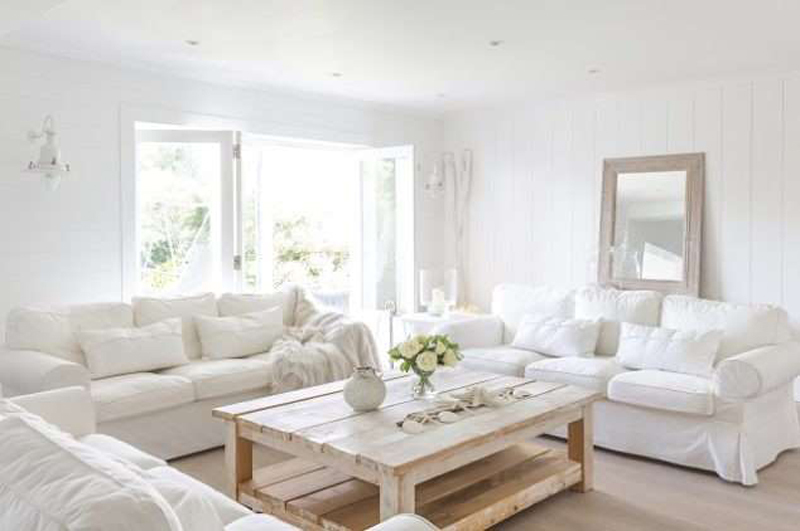 If a bright, white living room doesn’t immediately come to mind when you think of farmhouse style, you may want to brush up on this staple color. 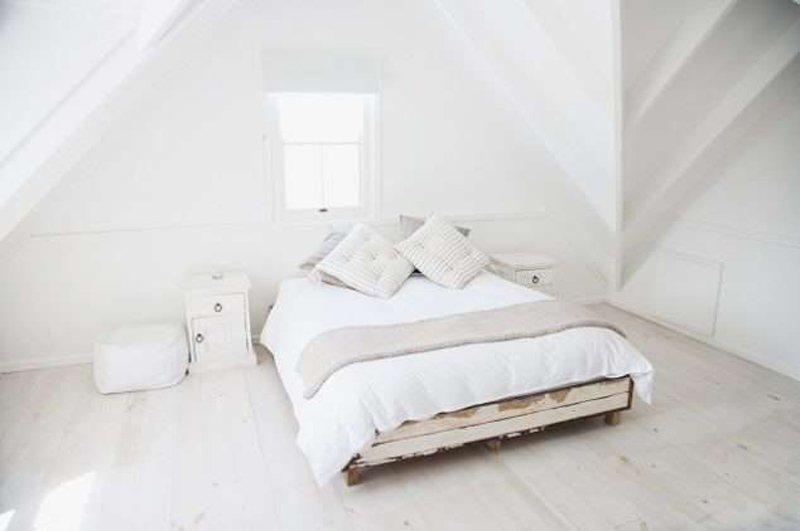 From wall colors and furniture to throw blankets, curtains, and counters, white (and all shades off-white) will make your house feel airy and spacious. Wood accents, bright green plants, and aged colors break up the monotony. Reds, blues, greys and oranges can bring calm or energy to each room. But don’t be afraid to shake up this color scheme even more with a pop of your personal style. 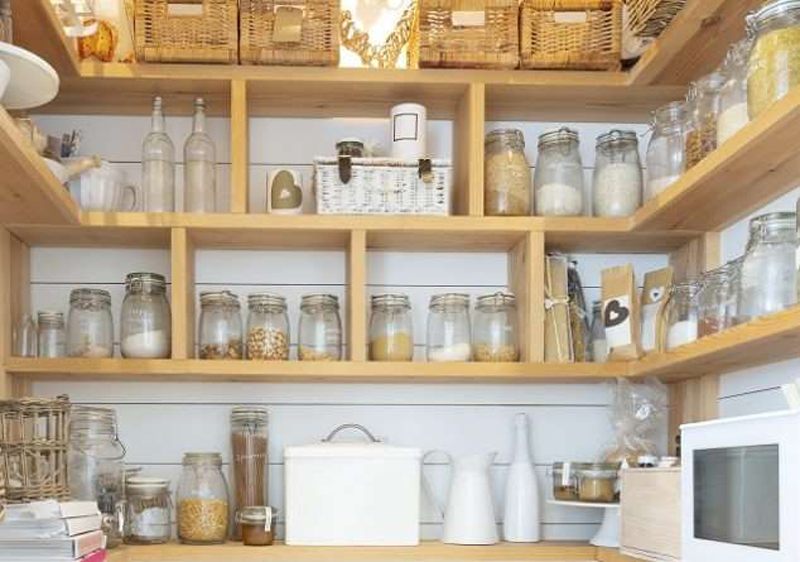 Create built-in shelving to house your jars of oats and canned green beans. Use wicker baskets to hide brightly-colored detergents and branded goods. Part of the luxury of a country home is feeling removed from excess noise–including clashing colors and brands begging to be rebought. Have a freestanding piece instead? Replacing the doors with annealed glass panels adds $700 or so to the project. Adding wavy or bubble glass will bump it up another thousand or so. Wavy and bubble glass is original in the windows of historic homes but not energy efficient, adding interior touches makes your farmhouse decor more authentic. Give old wood furniture a second chance with paint. Start with some small things–headboards, side tables, or a kid’s desk–and some chalk paint. “Chalk” paint is a matte paint made for furniture. Neutral colors are the standard for farmhouse style, but if you love a pop of bright color, go for it. Want an extra antique feel? Distress the paint with strategic sanding. These days you can buy chalk paint at home improvement stores for about $18, and a quart of polyurethane is $12. If your towel rack doesn’t bring you joy, consider replacing it with wrought iron hooks or a short, ladder-like rack. Style it in stone colors and bring in fresh flowers. Dark metal fixtures, like shower heads, pendant lamps, shelf braces, and faucets add a nice contrast to this mostly-white style. 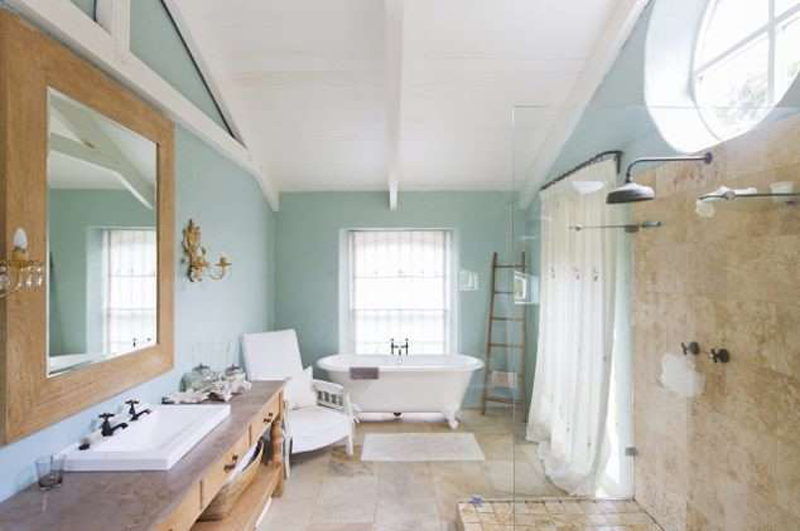 If you have the budget, install tile bathroom flooring in a beautiful pattern. If you really want to commit to the Gaines interpretation, install a subway tile backsplash or shower surround. Installing bathroom tile costs about $12 per square foot. Lush white shower sheets and gingham throws or hand towels put some of the finishing touches on your farmhouse style. Rough and low-thread-count fabrics create that humble country feel. Use it on upholstered chairs and cushions–even wicker storage baskets. Bedding should be comfortable (of course) and overflowing with a thick comforter or cozy quilt and a draped throw. Go the extra mile. Create a cozy reading nook in an alcove or bay window and finish it with a dozen pillows. 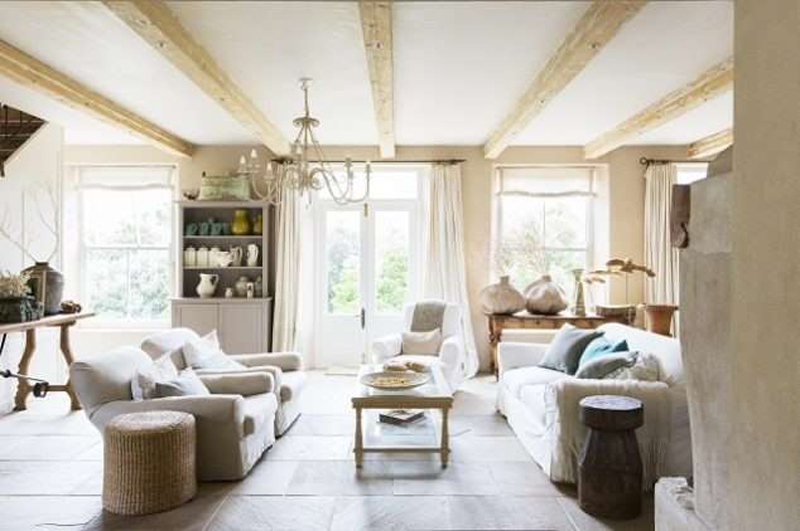 Look for tufted bench seats, sofas, chairs and headboards to incorporate a luxurious, French-inspired-South theme. Nothing quite says “country home” like the distinct sound of a porch door spring and–CLAP! 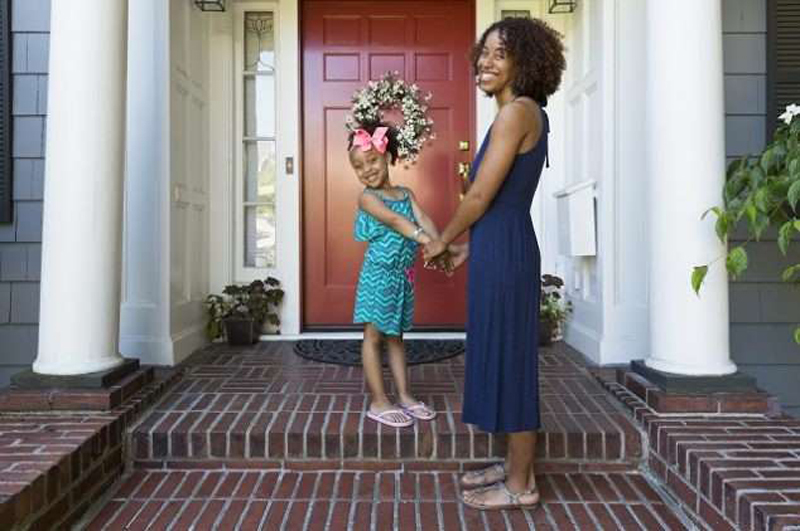 Enclosing a porch isn’t the smallest project, but it can add valuable, shaded (and mosquito-free) space for your family to gather and enjoy the fresh air. 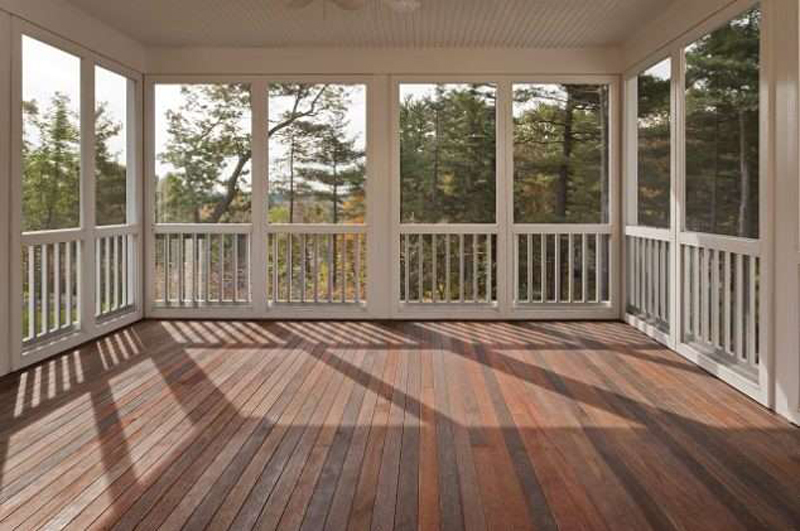 Screening in a porch costs depend on whether it’s already covered and if there are columns and railing. Find a door with a quaintly curved wooden frame. Don’t forget to paint the frames your favorite shade of white! No farmhouse is complete without a corner for dirt-covered boots and gloves. 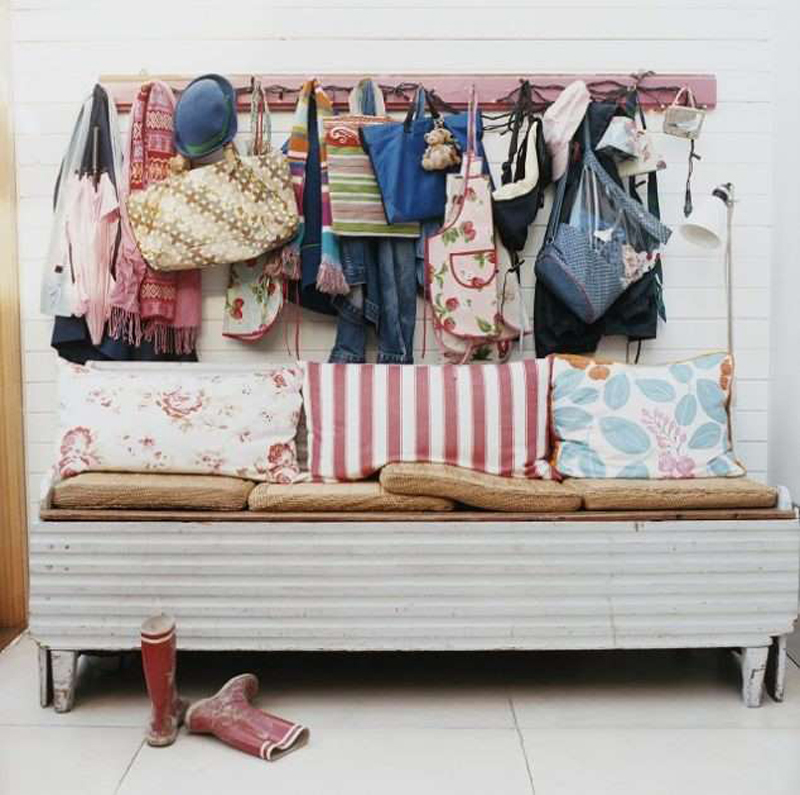 If a hall tree is out of your budget, simply place a bench under a few coat hooks by the back door. Maybe hang a cowboy hat or two. Add a place to put wet umbrellas and put a couple of photos on the wall. The only thing left to do is let this “lived-in” room earn its name. We hope you enjoyed this article of (maybe more than 20) farmhouse decor ideas. Let us know what you think about these tips and tell us what you love about farmhouse design in the comments below.